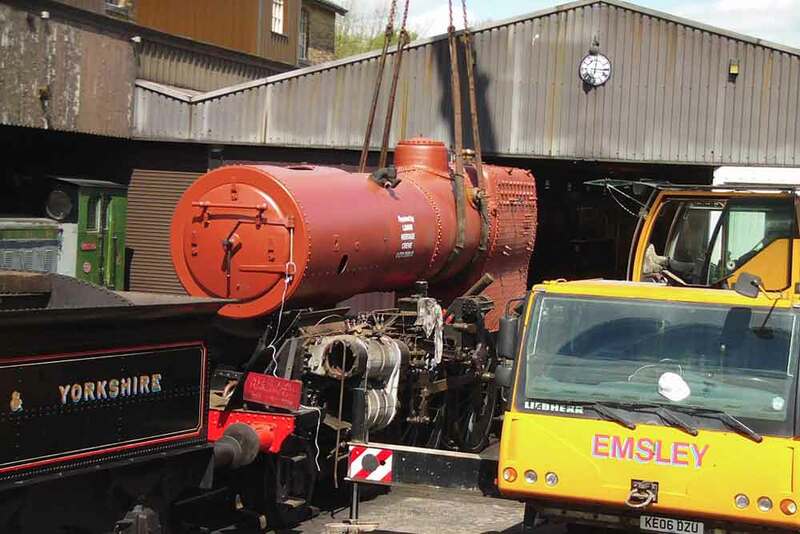 When a locomotive returns to action after an overhaul to working condition, the Railway can expect it to have a working life of approximately 10 years. As a result, the Railway can plan ahead based on when particular locomotives will be withdrawn and, therefore, will assess that locomotives replacement from the pool of stored locomotives at Oxenhope. This process has resulted in Taff Vale 0-6-2T no. 85 going through the works with an anticipated completion date in the not too distant future. 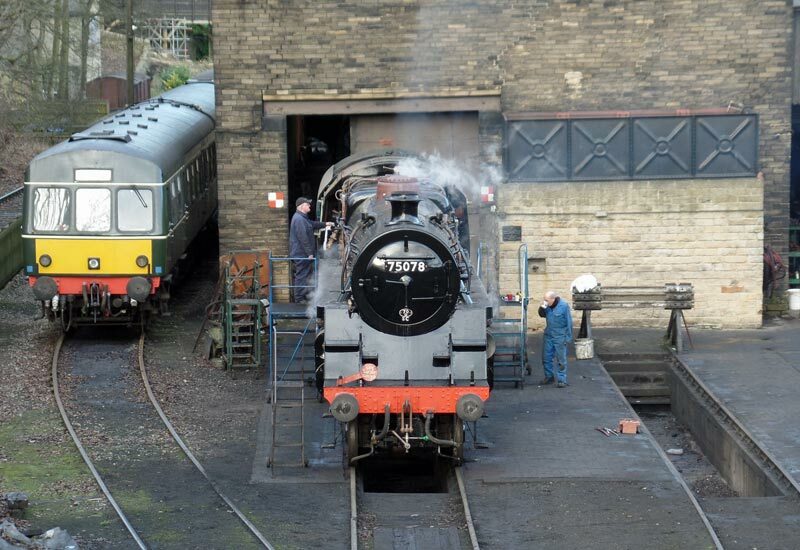 Also going through the works are Standard 2MT 2-6-0 78022 and Ivatt 2-6-2T 41241 both progressing well in their respective overhauls for completion in years to come. 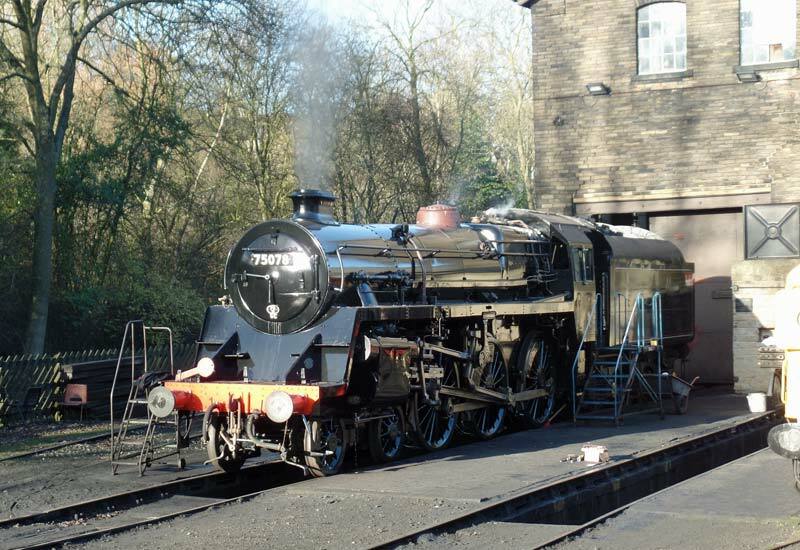 With MR 4F 0-6-0 43924 due for overhaul in 6 years, the next identified long term requirement is for a locomotive of power classification 4 and with this in mind Standard 4MT 2-6-4T 80002 was taken out of store at Oxenhope on the 28th May and moved down to Haworth Locomotive Works for assessment of the work required to bring it back into working order. Enthusiasts will have to wait some years before 80002 is in action again, but at this stage the Railway needs to know the feasibility and commitment of resources that will be required to bring the locomotive into traffic in the necessary timescale. 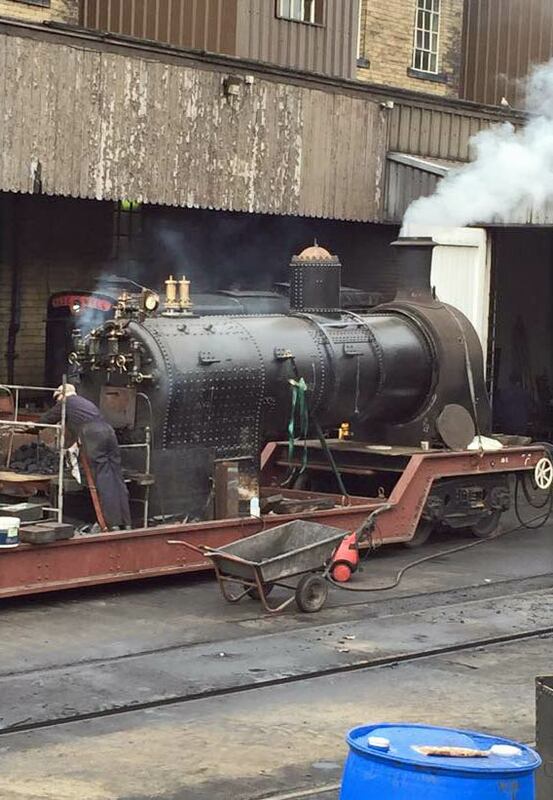 Following the recent completion of the in house boiler repair, Taff Vale Railway 0-6-2T no. 85 has successfully completed an ‘out-of-the-frames’ steam test. The images taken on 19th & 20th February 2015 show the Thursday (left) and Friday (right) of a 3 day project, the boiler being taken to full working pressure of 160 psi on the Friday, after some minor remedial work first thing that morning. 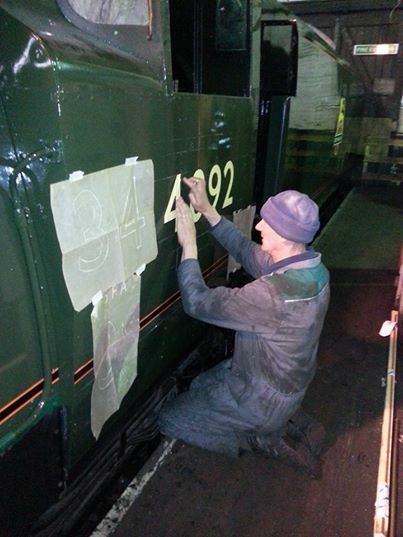 This is another step towards a full return to service later in the year, hopefully not too far away. Behind, no. 85 is MR 4F 43924 which was also having a steam test following its routine wash-out. 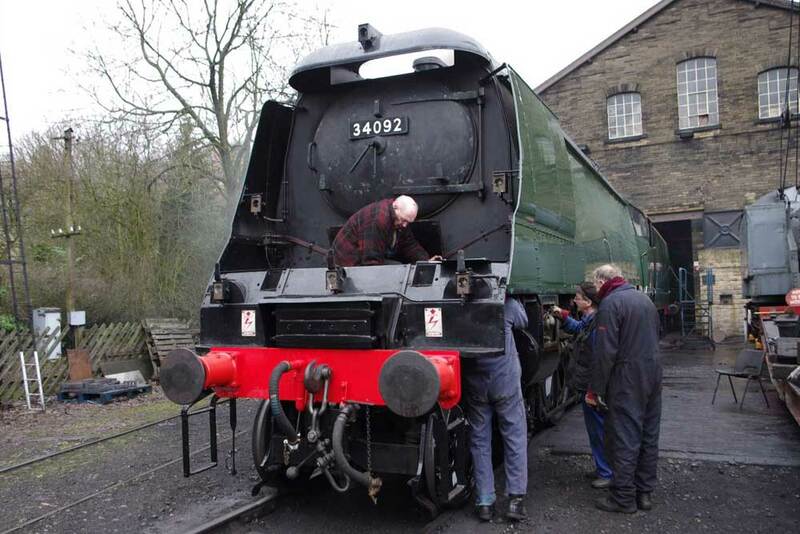 Unfortunately 43924, with maintenance required on the locomotive, will not be in action this weekend, see separate post. There has been considerable activity on 41241 in readiness for its return to steam in time for the 50th Anniversary in 2018 of the re-opening of the branch. 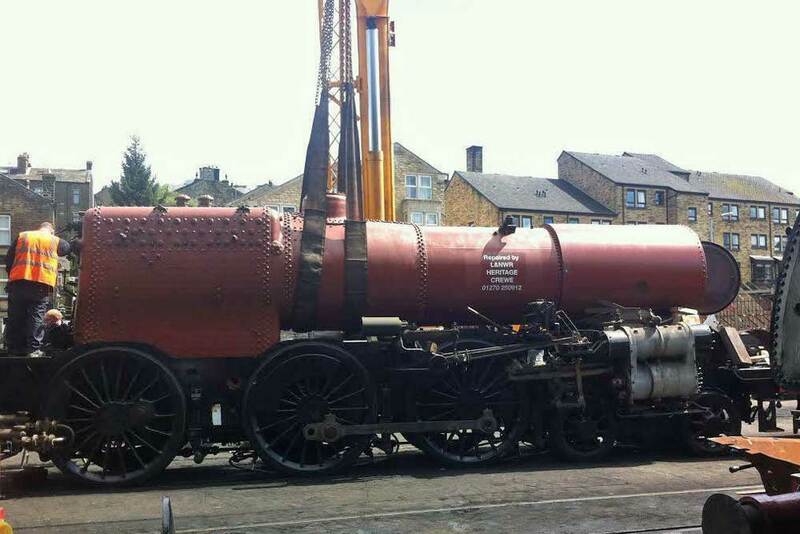 Having reported yesterday on the arrival from Crewe of Standard 4 4-6-0 75078’s boiler, today the boiler was lifted from the trailer that brought it over the Pennines and lowered onto the frames that had earlier been withdrawn from the shed (along with L&Y 2F 0-6-0 957 that was in front of it inside Haworth Loco). 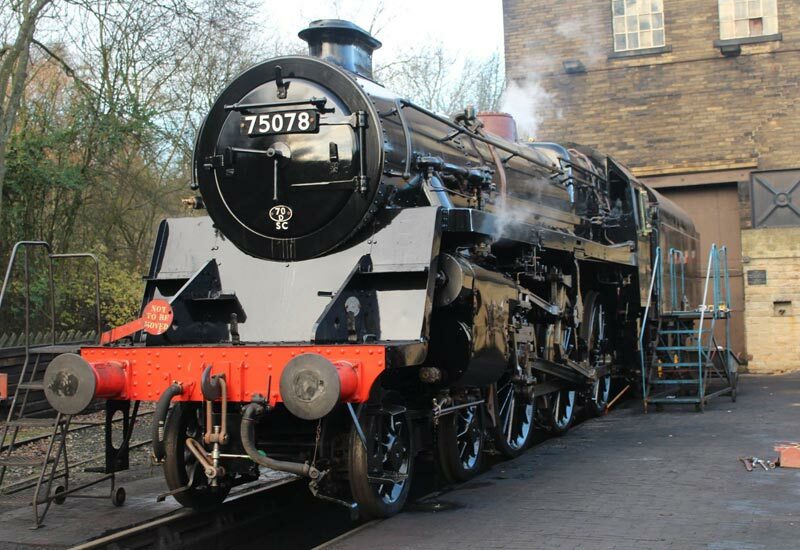 A major step forward was taken today with the arrival, in Haworth yard, of the boiler of BR Standard 4 4-6-0 75078 from L&NWR Heritage at Crewe. 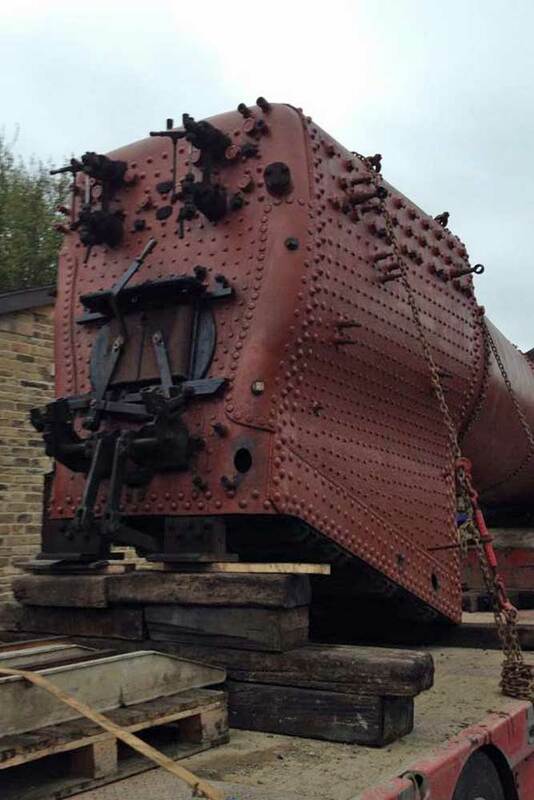 Whilst this is a boost for the restoration team, there is still a lot of work to do before we see this popular locomotive at the head of its comeback train up the Valley. Whilst all the attention has been focused on the return to service of 5820, the pending re-launch of ‘City of Wells’ and the pending start on the overhaul of 41241, out of the limelight the progress being made on TVR no. 85 has gone on unnoticed and unreported. It is some time since we saw no. 85 out on the branch but the team in Haworth Locomotive works have not left this withdrawn engine rest for too long. With the smallest useful engine available being MR 4F 0-6-0 43924, the Railway has been bereft of a small but handy tank engine to take the more lightly loaded trains on quieter days. 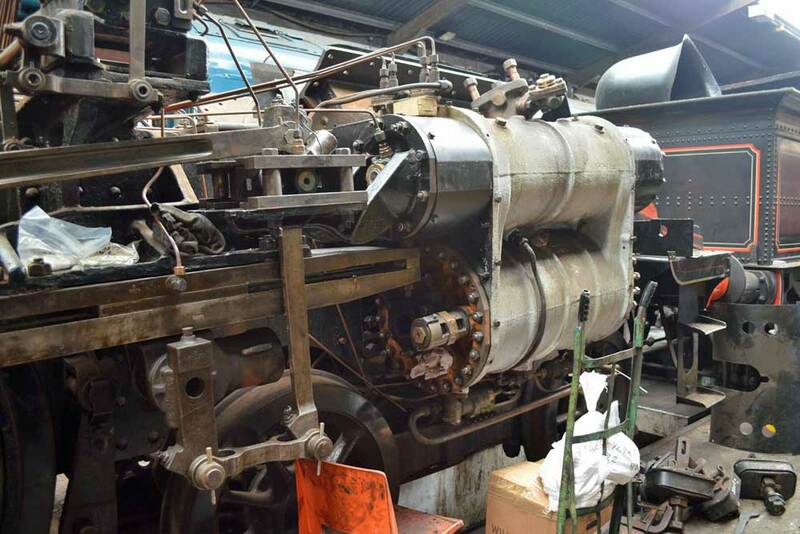 Since entering the shed the engine has been completely stripped down and a lot of work has been undertaken to return the locomotive to traffic, hopefully, later this year. Now fully painted and lined out with only varnishing to complete, this image from today is a first glimpse of the superbly painted West Country Pacific and hints that it is not too long before we will see the locomotive make moves out onto the KWVR main line. 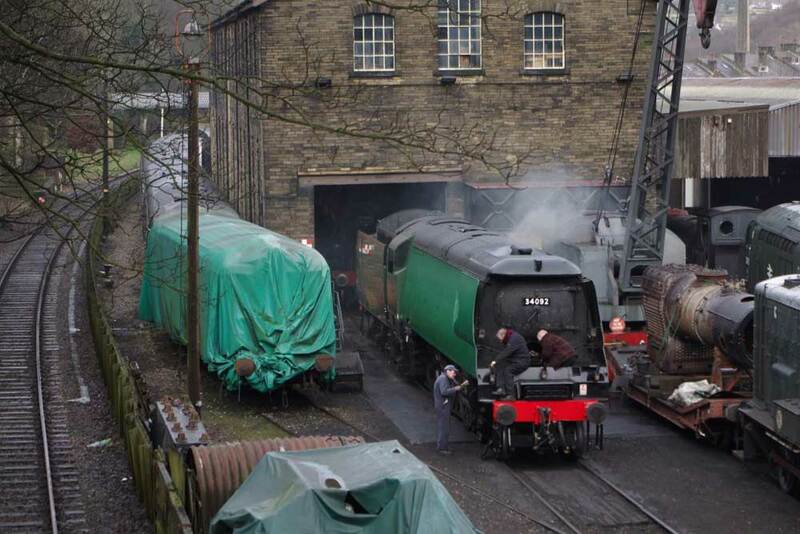 The move was made to allow the newly painted S160 5820 to be with drawn from the shadows of Haworth Loco. Click here to see a short 30 second Facebook video of the move. 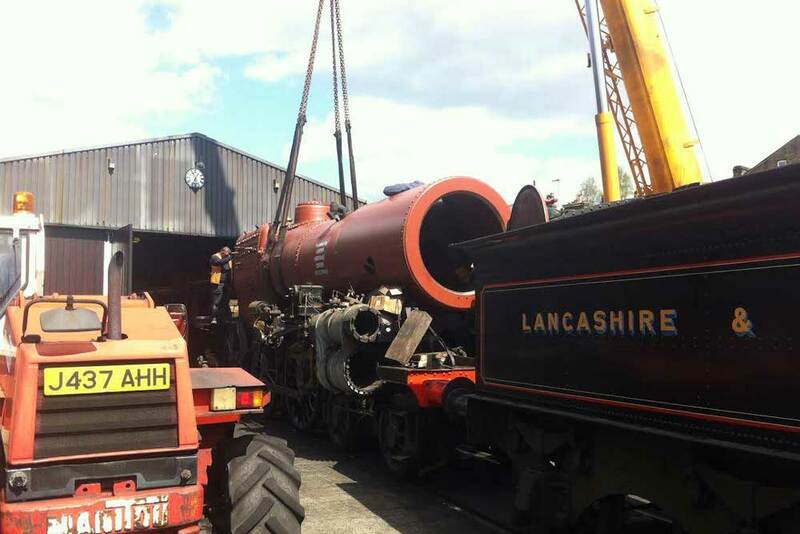 The Standard 4 Loco Preservation Society AGM took place on Saturday night and those present were informed that the boiler successfully passed its hydraulic test for the insurance company a week ago, at Crewe. 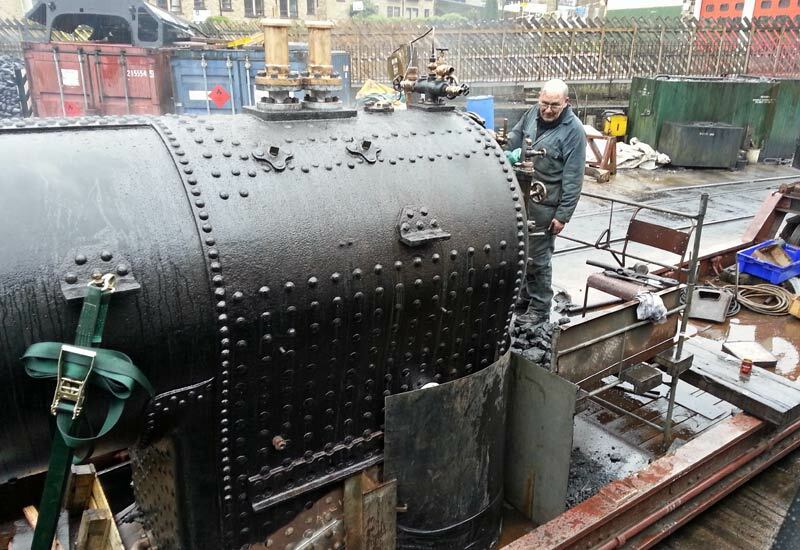 This of course will be followed by the steam test which is due in the next two weeks. 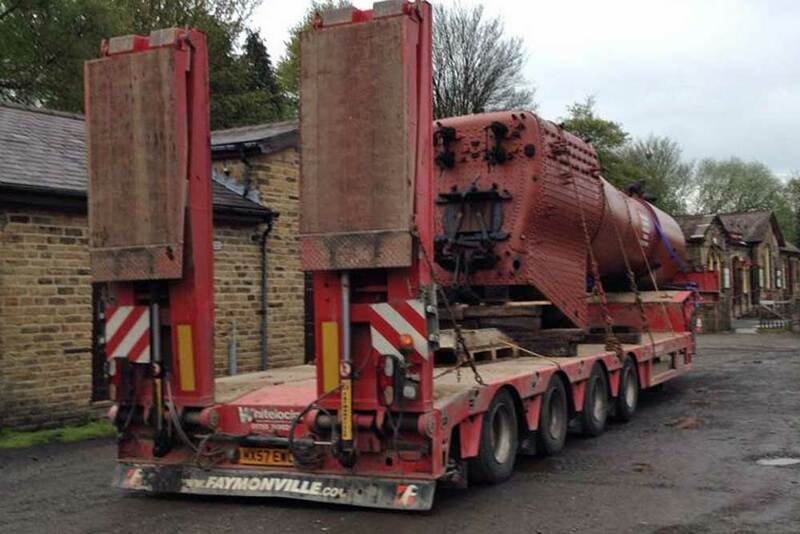 It is anticipated that the boiler will be delivered to Haworth at the end of April. 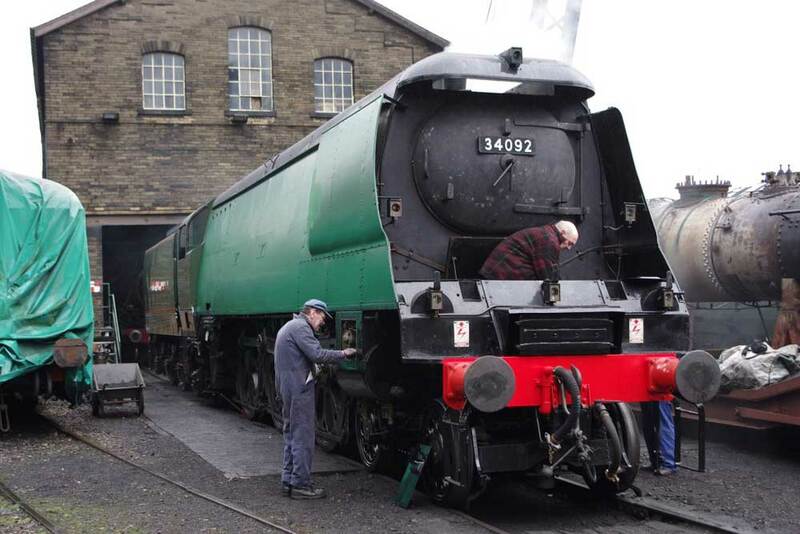 Once the boiler is received back at the loco shed, further boiler work is required when it is replaced in the frames. As always it will be ready when it is ready and not before but at the time of writing the project is on target for completion by the end of the year. So not too long to wait for a retake of the 16th June 1996 photograph of 75078 on GN Straight on the climb out of Keighley. 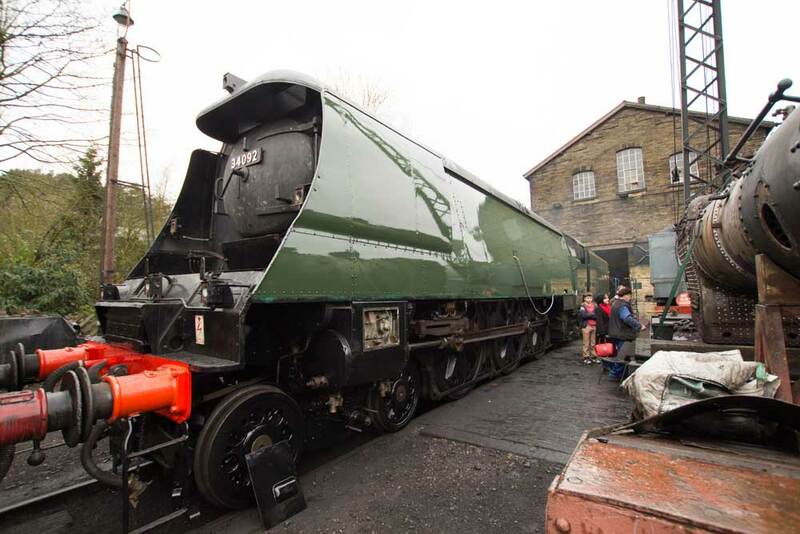 Having moved under her own power last Sunday, the completed locomotive has taken a step nearer to entering service with the application of the lining, numbers and British Railways early logo this week. 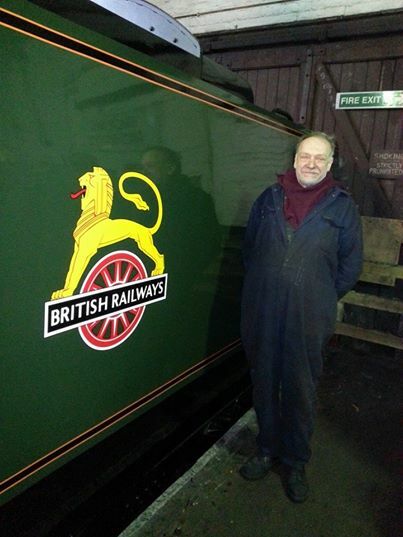 In the third photograph, chief engineer ‘Jock’ Adams justifiably looks proud of the achievement as this long and thorough overhaul, gets ever nearer to completion. 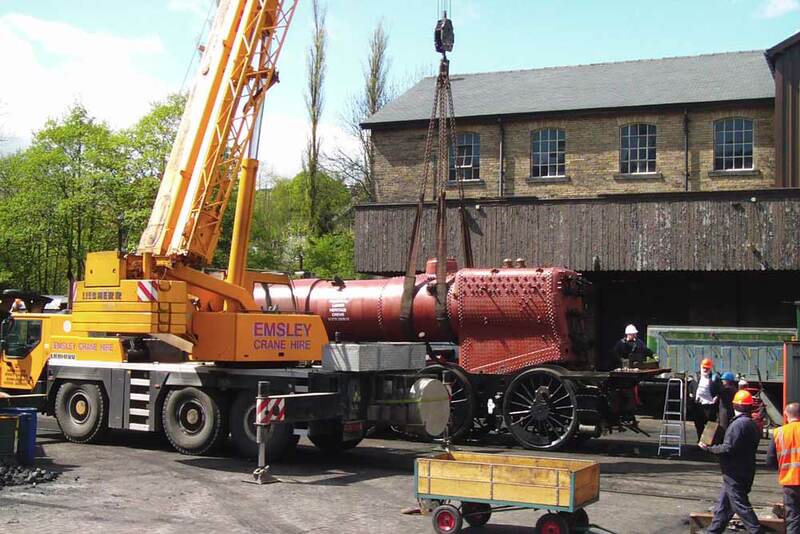 Whilst the Society await the full report from the Severn Valley Railway engineers, the Society’s in-house magazine, Push and Pull, has revealed the extent of the repairs required to return the locomotive to traffic in time for the 50th Anniversary of the re-opening of the branch, in 2018. New inner copper firebox and other remedial boiler work. Other small repairs plus ones as they arise. 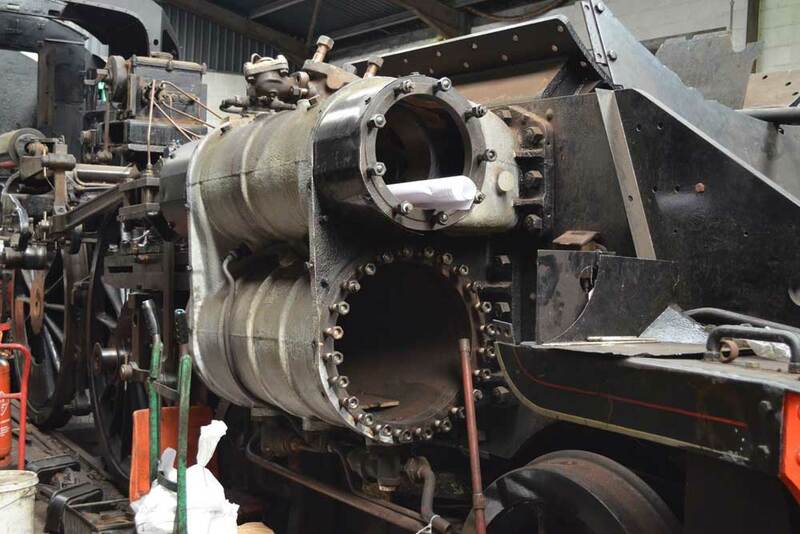 The estimated cost is in the region £350,000 for which the Society is launching an appeal to bring this iconic locomotive back into steam in time. Hot on the heels of last weeks steaming of SR Pacific 34092 City of Wells, the fire was raised again this weekend for the testing of the locomotive’s safety valves ready for its steam test yesterday. Very evident was the advanced stage of painting. Whilst the left hand side was still in a pale green undercoat, the right side was resplendent in British Railways Brunswick green albeit without BR lining (although progress towards this was evident). The reflection of the crane opposite was clearly visible on the mirror-like surface of the air-smooth casing. 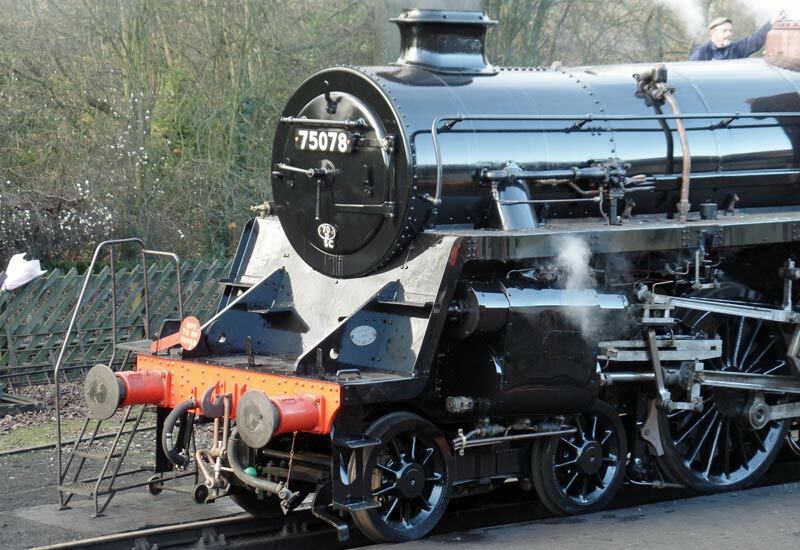 The advanced stage of the restoration is leading to much speculation among the enthusiast fraternity that the locomotive will be in steam at the weekend’s gala and, maybe, will move under her own power. The owners, however, are making no such noises, the engine will move when they are ready and not before. However movement did come a step closer as City of Wells successfully passed that steam test. 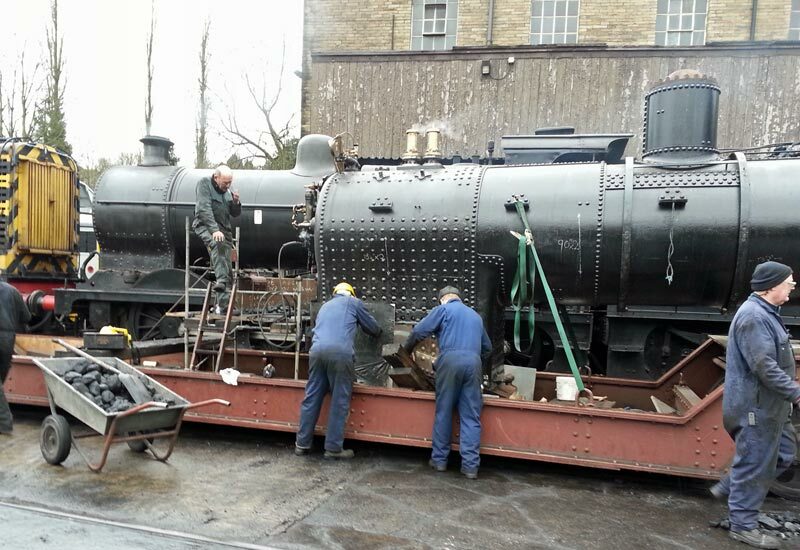 Last weekend saw a significant step in the restoration of LMS Ivatt 2-6-2 Tank 41241. As previously reported the iconic tank engine is being restored in time for the 50th Anniversary of the opening of the line in the preservation era. 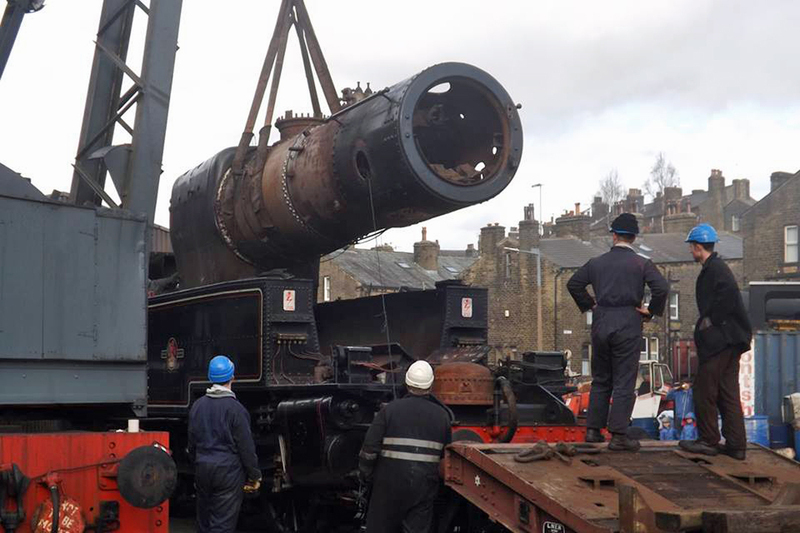 On Saturday 22nd February the following two images show the boiler being lifted from the frames so that a thorough inspection can be carried out to see the extent of the work required on the locomotive and its boiler.